An Okotoks-area woman says she was tired of hearing about sky-rocketing hay prices, or people getting ripped off when buying and selling hay so she has opened up a Costco-style membership hay business to try to provide an affordable and secure alternative for livestock producers. Cindy Wilinski says 100 years ago if you needed to buy hay for your livestock you tracked down a local farmer, by phone or in person, made a deal and hoped the product was as good as advertised. She said nothing much has changed today, except now it might be purchased via an email or over text message. "It's still the old handshake kind of deal and hope you don't get ripped off," said Wilinsky, who owns an equine training and breeding facility near Okotoks. Wilinsky said she first got the idea of bringing the hay business into the 21st century after a drought in 2015 left a lot of people scrambling to find hay. 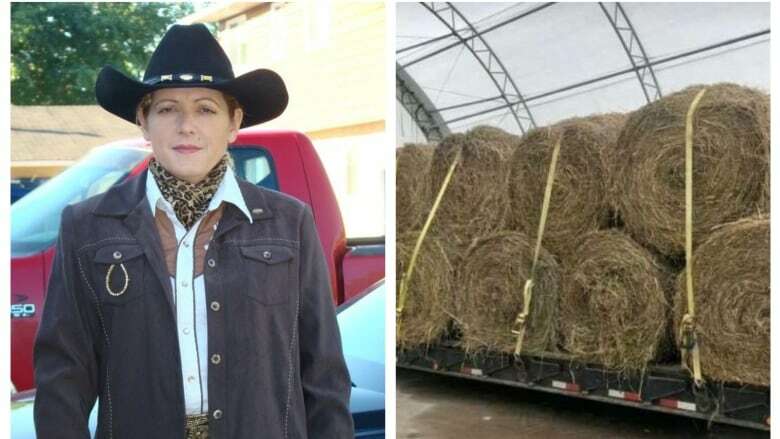 At that time she started a Facebook hay-sourcing group called the Haylist — a database that amassed more than 7,000 members — where people could list hay for sale, request hay and list trucking services. The Haylist is still going but Wilinski felt she could do more to help livestock owners find good quality, affordable hay from a credible and trustworthy source. That led to the creation of the Haybank, a Costco-style membership business she launched in the fall. And, the response has been overwhelming. "We literally ran out of all the hay we had lined up that was on the yard as well as what was coming." Rather than the handful of memberships she expected, 83 people signed up within weeks, including Priddis-area rancher, Danny Lansdowne. "This year hay is all over the map and I can't afford the $200, or $180 [per bale]," said Lansdowne, who purchased hay for his five horses and cows. Wilinski attributes the higher than expected demand to a prolonged drought pushing up the price of hay, while any lower priced hay is being snatched up, and in some cases, she says, it's being turned around and sold at a higher price. "You know it's just one of those things that turns your stomach." Those who sign up pay an annual $500 membership fee, plus the cost of the hay they purchase and transportation if needed. The fees allow Wilinski to purchase bulk amounts of hay, in some cases entire crops, and keep the transportation costs down. She's sourced hay as far east as Ontario, and south to Montana. "The problem has always been in making the trucking affordable so it's not landing here being priced higher than what they need locally for it," she said. From the feedback Wilinski's received so far, she says people are appreciative of having a secure way to buy hay. "And you're not sending an e-transfer to somebody you've never met for hay you've never seen." Wilinski said she tests the quality of the hay once it arrives, and only after she confirms the amount and quality does she put it up for sale. In the months since opening the Haybank Wilinski says she's managed to work out some of the kinks, address some of the growing pains and put a more balanced system in place. "(We're) just trying to make sure everybody gets the feed they need for this winter," she said. "Because by the looks of things so far we're going to have another year that's not looking so grand unless we get an awful lot of rain or some late snow." Wilinski said she's already heard from people who want to invest in her business and hopes to get more trucks rolling in order to service her customers even better.